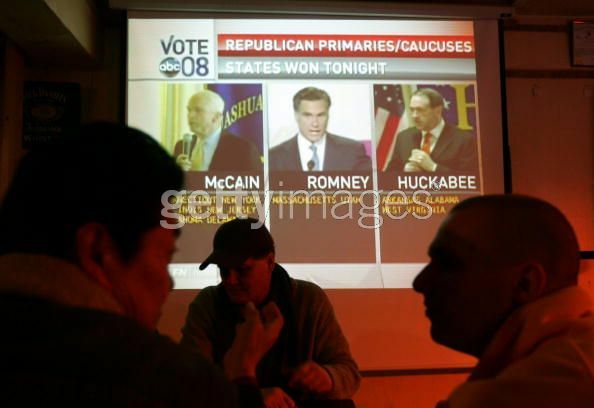 Taking advantage of the Lunar New Year holiday some Republicans Abroad Korea members gathered at the VFW Canteen in Seoul last Wednesday to watch the Super Tuesday results (Korea being 14-17 hours ahead of most of the USA). Turnout was a little disappointing, although expected since many of us were with family or were traveling that day. We had nine people come out, including one Democrat and one independent. Republicans Abroad members at the VFW Canteen in Seoul. Here is another picture including Kurt Mohay. Someone from the Chosun Ilbo was there as well. Thanks for the folks at the VFW for allowing us to have the non-partisan event at their canteen.